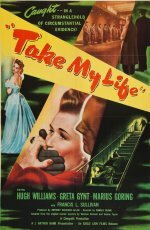 An impressive directorial debut from British cinematographer and production partner in Cineguild (the company that would make several of David Lean's early masterpieces) Ronald Neame, who would go on to be responsible for such major works as Tunes of Glory, The Prime of Miss Jean Brodie and The Poseidon Adventure. Hugh Williams is accused of murder and his opera singer wife Greta Gynt is determined to find out who really did it. This was the kind of intelligent thriller that Hollywood directors could churn out in their sleep and it is to Neame's credit that he makes it clever, convincing and above all, stylish. After this auspicious beginning, Neame's career as a director was assured. Take My Life is worthy of its rating and this dvd print is very good.